Sample application for late joining school, job, training program, event, ceremony, convocation etc. 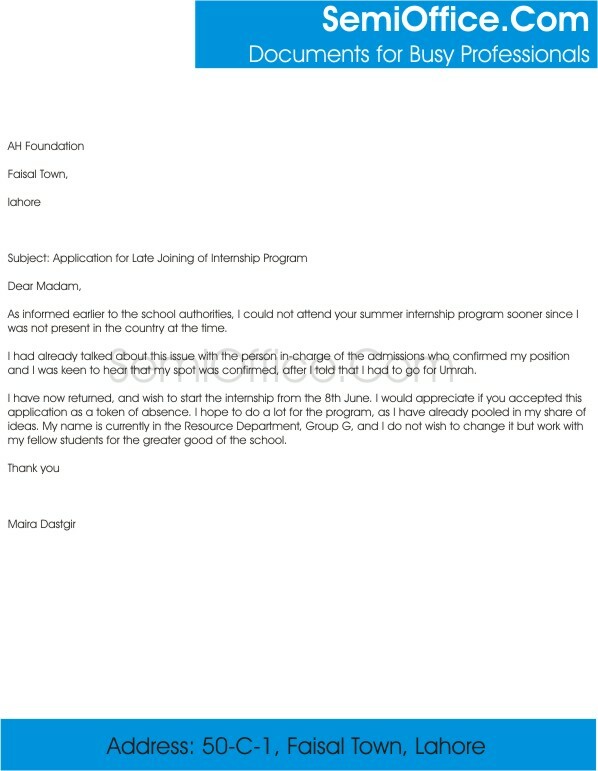 As informed earlier to the school authorities, I could not attend your summer internship program sooner since I was not present in the country at the time. I had already talked about this issue with the person in-charge of the admissions who confirmed my position and I was keen to hear that my spot was confirmed, after I told that I had to go for Umrah. I have now returned, and wish to start the internship from the 8th June. I would appreciate if you accept this application as a token of absence. I hope to do a lot for the program, as I have already pooled in my share of ideas. My name is currently in the Resource Department, Group G, and I do not wish to change it but work with my fellow students for the greater good of the school. I am registered at your organization as an internee. Owing to my examination I could not join your organization from 1st July. Now, My exams have been finished. So I am joining your institution from 8th July.